TomTom PRO 7100 TRUCK features a 4.3-inch display and is pre-installed with mapping for 45 countries across Western and Central Europe. In addition the TomTom PRO 7100 TRUCK provides access restrictions in 22 European countries, routing around known dimensional, weight and hazardous materials restrictions. Diversions, rerouting and size restrictions: every day your drivers face a bewildering number of challenges to get the goods through. TomTom PRO 7100 TRUCK uses smarter navigation to plan better routes for your drivers. They are less likely to get stuck, delayed or drive unnecessary distances - meaning efficient journeys and accurate scheduling. TomTom PRO 7100 TRUCK has been discontinued. TomTom PRO 7100 TRUCK featires a 4.3-inch display and is pre-installed with mapping for 45 countries across Western and Central Europe. In addition the TomTom PRO 7100 TRUCK provides access restrictions in 22 European countries, routing around known dimensional, weight and hazardous materials restrictions. Diversions, rerouting and size restrictions: every day your drivers face a bewildering number of challenges to get the goods through. The PRO 7100 TRUCK uses smarter navigation to plan better routes for your drivers. They are less likely to get stuck, delayed or drive unnecessary distances - meaning efficient journeys and accurate scheduling. Start driving with the latest map - guaranteed! If a new map for the TomTom PRO 7100 TRUCK is available within 90 days of first use, you can download that map once for free via http://business.tomtom.com/getstarted. Routes around known dimensional, weight and hazardous materials restrictions in: AT, BE, CH, CZ, DK, DE, ES, FI, FR, GR, HU, IE, IT, NL, NO, LUX, SE, SI, SK, PL, PT, UK (Access restrictions for major and interconnecting roads). Avoid unnecessary maneuvers in dead-end streets. With the TomTom PRO 7100 TRUCK you save money by, using the fastest route and route calculation and avoiding idling with IQ Routes, you'll be efficiently on the move avoiding worker downtime. TomTom PRO 7100 TRUCK can be part of TomTom WORKsmart solutions - for effortless fleet management. Inform your customers of the arrival times, use the digital tachograph information to reschedule your plans in real-time or manage working hours effortlessly with a single click. Your drivers are out there on the road every day, so you know that being on the road and getting to your destination can be quite a challenge. Road works, traffic jams, speed cameras... even a short journey can be time-consuming and costly. Now your drivers can drive smarter, every day - wherever they go. TomTom LIVE services offers a real-time connection to the latest route information such as traffic information, etc. straight to the vehicle; saving your business and your workforce time, money and stress. HD Traffic is a LIVE service that provides accurate traffic updates for motorways, major and minor roads. It's simply the best traffic service available. It also gives you detailed incident reports, estimated delay times and alternative route proposals. So no matter what problems your drivers face on the road, HD Traffic will find a way around them. The TomTom Speed Cameras service alerts drivers to the location of 25,000 fixed speed cameras stationed across Europe and any mobile speed cameras along the way. When your drivers know for sure there's a camera up ahead, they'll drive more safely and avoid speeding fines. Which is good news for them, and excellent news for your business. This clever service speeds up the time it takes to fix your GPS position, helping you to set off within 30 seconds - even when the GPS signal is weak or partially blocked. TomTom Weather gives you local daily and five-day forecasts on the TomTom PRO 7100 TRUCK, helping you make plans based on the weather. You can also find out about road conditions to make sure you get to where you're going safely. TomTom Local Search with Google helps drivers find whatever they're looking for, wherever they happen to be. Just type in any search word and the Google application will list all the hits in the local area, including the approximate distance from your present location. Select the one you want and the TomTom PRO 7100 TRUCK will take you there. Simple. TomTom PRO 7100 TRUCK mounts on the inside of your vehicles windscreen using the suction cup windscreen bracket provided. TomTom PRO 7100 TRUCK can be powered directly either from its internal battery (for up to 3 hours) if it's fully charged or powered from the cigarette lighter socket. 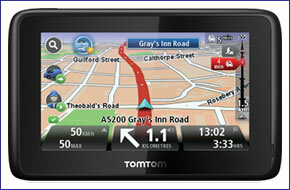 The TomTom PRO 7100 TRUCK sat nav comes with the latest and most complete maps of Western and Central Europe. Door-to-door accurate navigation anywhere across the continent. Which in addition to street information include features such as route calculation, Points of Interest, Estimated Time of Arrival, and TomTom Map Share technology. TomTom’s unique Map Share technology enhances your navigation experience, because you can now make instant changes directly on your map. TomTom Map Share technology allows you to make corrections to your own map and benefit from thousands of corrections made by TomTom users every day - free of charge. Dimensional, weight and hazardous materials restrictions on major and interconnecting roads in Austria, Belgium, Denmark, France, Germany, Hungary, Ireland, Italy, Luxemburg, Portugal, Spain, Sweden, Switzerland, The Netherlands, United Kingdom and major roads for Czech Republic, Finland, Greece. Norway, PoLand, Slovenia, Slovakia. Make corrections to your own map to help keep your device up to date.